The five impressive reception rooms are beautifully proportioned and offer a suitably elegant, grand backdrop for special occasions whilst retaining the charm and welcoming feel of a private home. Guests arrive into the Stair Hall and are greeted by the fabulous, double, stone staircase sweeping gracefully up to the Minstrel’s Gallery, an impressive 100 foot long vaulted space dotted with Persian rugs and antiques that connects the reception rooms on the first floor whilst equally serving as a fine reception area of its own. At the heart of the interconnecting reception rooms is the elegant drawing room with vast log fire with superb Piranesi chimneypiece, Bluthner Grand Piano, sumptuous sofas and double height windows offering fabulous views over parkland to the Cheviot hills beyond. Adjoining the drawing room is the impressive dining room with sparkling chandelier, large windows and ornate plaster cornice. Up to 80 guests can be seated in the dining room for a banquet, or smaller numbers for a more intimate dinner or lunch. In colder months a fire can be lit in the magnificent marble fireplace, adding an atmospheric glow to the space. Stair hall with impressive double stone sweeping staircase. Farmhouse kitchen for relaxed breakfasts and kitchen suppers. Billiard room with full size table. Bedroom eleven with twin beds and a large window looking east down the lime avenue. Contemporary, en suite marble-clad shower room. Bedroom twelve with double bed with toile curtains and an elegant Edwards & Roberts writing desk. ‘The Glorious 12th bedroom’ is a bow fronted room celebrating Victorian country sports, with king size double bed, an antler chandelier and hand-woven Home tartan throughout. En suite bathroom with a magnificent bath with rainforest shower over, WC and basin. This is the only brick-vaulted octagonal turret bathroom in the castle. Drawing room with open fire and grand piano suitable for drinks receptions and afternoon tea. Dining room seating up to 80 guests around multiple tables or smaller numbers around a large dining table. Ballroom seating up to 80 guests on round tables or theatre style. Also ideal for post-dinner dancing. Morning room with large flat screen TV with DVD player and bar. Bedroom one is Wedderburn’s largest bedroom with Chippendale four poster bed and a beautiful bow front with octagonal turret. En-suite bathroom is an octagonal turret room with huge bath with rainforest shower over, French Belle-Époque double basin and elegant arched windows. Bedroom two is a cosy room with zip and link beds which can be set up as super king double or twin as preferred. Bedroom three is a bow fronted room facing the east with king size four poster bed. En-suite bathroom is with 6' bath and rainforest shower over, WC and double basins. Please note there is no bedroom four. Bedroom five with Chippendale four poster bed dating from 1770, single bed and views over the south lawn. En-suite bathroom with roll top cast iron bath, Fired Earth Italian console basin and two huge arched windows with views to the Cheviot Hills. Bedroom six with zip and link beds which can be set up as a super king double or twin as preferred and beautiful Edwardian furniture. Family shower room sitting opposite bedroom six in the courtyard turret with large walk in shower, WC and basin. Bedroom seven with king size double four poster bed sitting in centre of the castle with large windows facing the south. En-suite bathroom with bath with rainforest shower over, WC and twin basins. Bedroom nine with king size bed, single bed and charming marble fireplace. En-suite shower room with walk in shower, WC and basin. Bedroom ten with king size bed and adjoining turret room with single four poster bed. Family shower room sitting adjacent to bedroom ten with shower, WC and basin. Bedroom eight is a family suite with unparalleled views, double bed and two single beds. En-suite bathroom with original William Morris wallpaper from 1898, huge Victorian roll top bath, Italian console basin and basin. 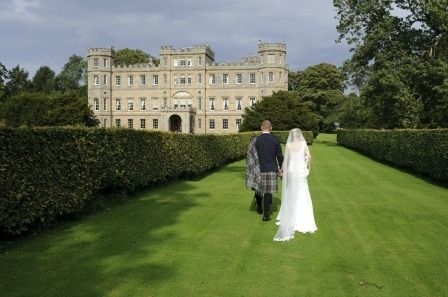 Wedderburn Castle sits within 80 acres of beautiful landscaped gardens and parkland providing the perfect venue for events, drinks receptions, wedding ceremonies or just relaxing with a good book. Green wrought iron furniture sits at the front of the castle, overlooking the lawns, ancient yew trees and elegant beech hedges. There is ample parking available on the gravel area in front of the castle. There are two cots available which can be placed in any bedroom except bedroom 8. Highchairs are also available along with a pushchair, baby bath, and toys for young children. 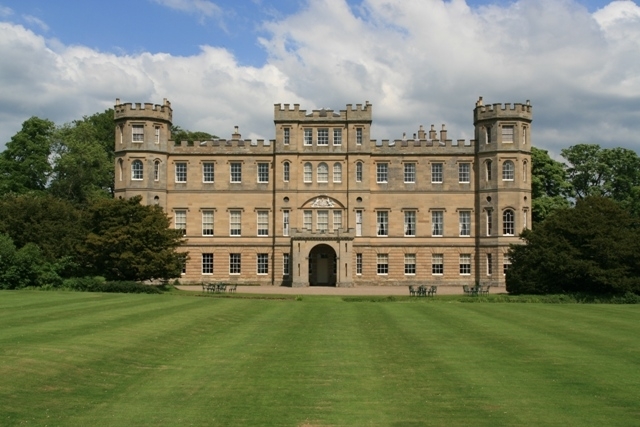 Regretfully Wedderburn Castle is not suitable for dogs. Guests are provided with luxurious bathrobes and towels along with guest toiletries. There is a hairdryer in every bedroom. There is Wi-Fi at the castle. Due to the size of the property and the thickness of the walls, the signal does not extend throughout the castle. There is mobile signal on most networks in the castle and grounds. A powerful modern heating system ensures the castle is always warm and there is ample hot water.